When over 10,000 people were evacuated from Ambae Island as a volcanic ash cloud overwhelmed their villages, many had no way of contacting their family or loved ones. Two of the Ambae Island evacuees who received phone credit from Vanuatu Red Cross Society. 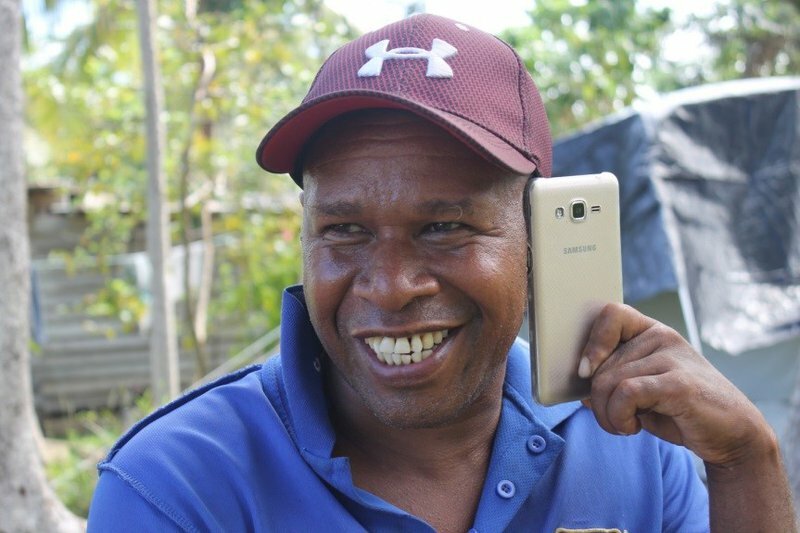 To keep these families evacuated from Ambae Island connected, Vanuatu Red Cross Society has provided phone credit through the Phone credit transfer programme. The programme is among the first of its kind for the Pacific. Phone numbers of evacuated households were collected as Vanuatu Red Cross teams assisted with the mandatory evacuation of Ambae during July 2018. Top up cards were then supplied to 600 households of evacuees now living on the neighbouring islands Maewo and Santo. 700 more families receiving phone credit via electronic transfer. Households could have the credit applied to one phone or split between two. It is not yet clear when, if ever, evacuees will be able to return to Ambae. Through the Phone credit transfer programme, more than a thousand households have connected with their loved ones for assurance and comfort. The emotional impact on families separated by disaster can be huge, which is why keeping people connected is a vital part of humanitarian work. Services like the Phone credit transfer programme and our Restoring Family Links services help to reunite loved ones who have lost contact due to disaster, migration or armed conflict. To learn how we are working to keep families connected, head to Restoring Family Links.